Reading & Book Signing at The University Bookstore Mill Creek. Caspar Babypants is the stage name for Chris Ballew, lead singer and songwriter for The Presidents of the United States of America. Now he makes music for babies and their parents. 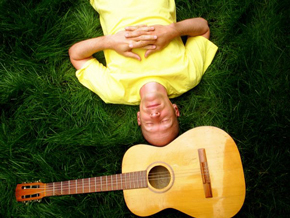 His goal is to provide simple, timeless, high-quality, relaxing and imaginative music for the new parent and baby to enjoy together. Sure, Caspar Babypants plays music for toddling rockers, but it's fun for the whole family. Grab your little one, your little one's dancing shoes, and then grab your own and enjoy a visit from a store favorite. Sponsored by Top Pot Doughnuts. "Ballew's first brush with children's music came in 2002 when he recorded and donated an album of traditional children's songs to the nonprofit Program for Early Parent Support titled 'PEPS Sing A Long!' Having a son and daughter himself, he enjoyed making the record but didn't think about it again until 2008 when he discussed working on a children's book with his wife, artist Kate Endle. Ballew began digging up nursery rhymes and folk songs in the public domain, songs that have been reinterpreted and passed down through generations. This, in addition to a number of original songs, formed his first full-length release, 'Here I Am!'" "The album was a hit, and Ballew began to perform in the Seattle area. A longtime friend, Fred Northup, heard the album while working on a project with Ballew, and Northup offered to play as his live percussionist. Northup, a Seattle-based comedy improvisor, suggested his frequent collaborator Ron Hippe as a keyboard player, and Ballew subsequently auditioned Hippe. Christening the two 'Frederick Babyshirt' and 'Ronald Babyshoes,' they officially became the Caspar Babypants live band in 2009. Ballew is the primary creative force behind Caspar Babypants and records, produces, masters and distributes the albums from his home studio. Northup and Hippe frequently appear on his newer recordings and play at live performances in various combinations." "The fourth album 'SING ALONG!' came out on 8/16/11 and is influenced by old work songs from the turn of the century and call and response folk music from Africa as well as early rock and roll and folk music from America."